Wow, spectacular renovated unit!! Directly on the beach!! BONUS -- FREE WIRELESS INTERNET (EVEN POOLSIDE!) FREE LONG DISTANCE (USA/CANADA), FREE NETFLIX, DIGITAL CABLE WITH OVER 200 CHANNELS, 4 FLAT SCREEN TV's (3 are SMART TV's WITH FREE NETFLIX!! ), FULL ENSUITE LAUNDRY, PACK 'N PLAY IN OUR UNIT!! Enjoy an amazing view to the beach and ocean from almost anywhere in the condo; the preferred 4th floor location is high enough for a fantastic view over the beach (not to mention the amazing sunsets), and low enough to enjoy the sound of the surf from your living room and master bedroom, which both have direct access through huge glass doors to the extra-large (22 foot) balcony (see picture showing view from balcony). Over $80,000 spent on a TOTAL RENOVATION & UPGRADE to this 1100 sq ft (2 bedroom + den/3rd bedroom) unit! NOTHING has been left untouched - see details below, this condo is basically BRAND NEW. There are a few pictures here, check the link below to our website for lots more pictures. channels, 32' flat screen in master, 26" flat screen in den and 2nd bedroom, two DVD players. In the gulf-front master overlooking the beach, there is a king-size bed, walk-in closet, ensuite bath with a pedestal sink in the shower/toilet area and another granite vanity with sink in a separate area (two people can get ready at once - this is the only unit in the building set up like this). In the second bedroom (similar in size to the master at 15x12), which overlooks the intercoastal waterway, you will find queen and double beds, with access to the second bathroom with a large shower/soaker tub, pedestal sink & toilet. The den/third bedroom (overlooking the intercoastal waterway) has a day bed with trundle (two single beds). There is also a Graco Pack 'N Play that can be used for the smallest family members as a crib, no need to rent or drag one through the airport!! Sandcastle I has some of the most beautiful grounds along the beach, and the management takes great pride in the condition of the common areas. There was a major renovation completed in the past couple of years to the outside & common areas of the building, it shows as new and has a beautiful BEACHFRONT HEATED POOL and LARGE SPA/HOT TUB next to the pool, overlooking the beach. Other amenities include a sauna, lending library, ping pong/recreation area, poolside washrooms & change rooms. For you BBQ lovers, there are two gas BBQ’s on the grounds as well as a charcoal grill - complete with tables to relax & enjoy a beverage while doing your grilling. Indian Shores is located on a barrier island on the Gulf of Mexico, between Clearwater and St. Petersburg, and is easily accessible via several major airports, including Tampa (TPA), St. Petersburg (PIE), and Sarasota Bradenton (SRQ). You can also fly into Orlando (MCO) if your plans include Disney, which is less than two hours away (along with Sea World, Universal Studios, Gatorland, and all the other Orlando attractions). In the immediate Tampa Bay area, there are unlimited attractions such as Busch Gardens, Adventure Island, the Florida Aquarium, John’s Pass, the Lowry Park Zoo, just to name a few. Into sports? It’s all here: NFL Football (Buccaneers), Major League Baseball (Devil Rays, as well as well as spring training for many MLB teams including the Yankees, Blue Jays, Phillies & others nearby), NHL hockey (Lightning) and countless golf courses. If boating is your thing, there are rentals available directly across the street on the intercoastal waterway & boat slips are available within walking distance. Shopping? You won’t be disappointed; shopping from high end to factory outlets all within a short drive! Our condo is managed by a local property management company located 2 minutes south of the Sandcastle. They have been in business under the same ownership for 28 years. The Suncoast Beach Trolley (stops outside the building) is a convenient way to get around on the beach if you don’t want to drive. If you do drive, there is a covered parking spot assigned to our unit and limited guest parking is also available. This is a non-smoking unit. Sorry, pets are not allowed in the condo or on the grounds. Sandcastle 1 is a family/adult building. If this does not suit your needs we would respectfully ask that you look elsewhere. Primary renter must be min. 25 years old and must occupy unit - strictly enforced. We are a family of four with two girls. We have been travelling annually to this area since well before the girls were born. We enjoy this area because it immediately makes you feel at home. The area has a great 'beach vibe' with lots of great local restaurants, many with live entertainment, but is also as quiet and peaceful as you want. If you want to be in the middle of the action, Clearwater and St. Petes are both an easy 10 minute drive. There is endless entertainment opportunities, with Tampa next door and Orlando 90 minutes away. If theme parks are your thing, we have that. If sitting beachside or poolside with a good book and a cold drink is your thing...we have that. If you like good restaurants....we have that. If you'd rather BBQ your own steak or fresh catch of the day...we have a gorgeous kitchen and BBQ facilities. If your idea of a busy day is beach, pool, hot tub, nap on the balcony with the sound of the waves....we definitely have that! We truly hope you enjoy our little piece of paradise as much as we do. 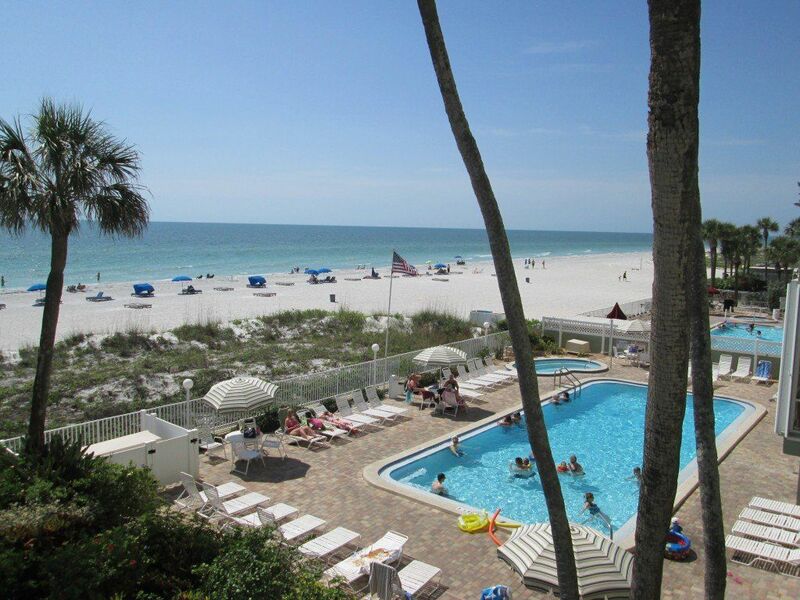 Directly on the beach and completely updated!! Enough said! Great heated pool, largest in the area. New Large Hot tub. Beautiful grounds, Rec room with ping pong table, lending library and self-serve tourist info. Superb location with lots of good restaurants and activities nearby, several withing walking distance. Master full ensuite bath PLUS 2nd sink/vanity area, unique to our condo! Central Heat - not that you'll need it! FREE, in condo, and in pool area. Our week stay here was wonderful. The condo is beautifully furnished, clean and has everything you will need. Sliding glass doors open up from both the living room and master bedroom to the beautiful beach. We enjoyed listening to the waves of the ocean every night, long walks on the beach looking for shells. The bbq's on the property could use some updating as they are missing knobs and are difficult to light and the pool tends to attract families so we went to the beach everyday. We definitely recommend this property and hope to return soon! Awesome condo in a great location. The ocean front views are excellent. Condo is in a great building and everything is well maintained. Owners are very helpful and we had everything we needed. We have traveled to Sandcastle I each March for the last 4 years, and I have to say that this is the best unit I have stayed in by far. Great updates and room layout is fantastic. I cannot wait to book again next year. Owner was extremely helpful and answered all my questions prior to our stay. Highly recommended. Wonderful family, would welcome back anytime! Great communication and left property in great shape! We are lucky to have Jeremy's family added to our 'VIP repeat guest' list! Great condo, good location, wonderful beach. Owners were very responsive to our needs. Awsome place for a vacation. Great condo!! Very clean and updated, has everything you need. Perfect beachfront view. Hope to go back next year. Condo was great, everything you need to enjoy your vacation is at the condo. My only complaint on the condo was that the bedrooms stayed warm for us. We like it a little cooler while we sleep. The beds were all comfortable, they had toiletries that most places don’t as well as beach toys, chairs and beach towels. Thanks so much for your review, glad you enjoyed!! I know it was in the mid 90's when you were there but our central AC is only two months old, never had an issue- perhaps a clogged filter - will check with our maintenance man. Thanks again!